Tomorrow marks Riverton’s 121st Children’s Flag Parade. Inevitably, around this time of year a child or an out-of-town visitor will ask, “How did this wonderful July Fourth Parade originate? Well, kids, this authoritative article written by Borough Historian Paul W. Schopp for the 2018 Riverton 4th of July Program Booklet will transport readers back to July 4, 1897, as he examines the very genesis of the Children’s Flag Parade we celebrate today. Rivertonians have always celebrated our nation’s birthday with grand panache. Houses and businesses festooned with flags, ribbons, garlands, and bunting lined the town’s streets in the past just as they do today. Prior to 1897, sporting events filled the Fourth, providing revelers with spectacles ranging from baseball games to boat races on the Delaware River to competitive cycling at the Riverton Athletic Association quarter-mile velodrome between the years 1894 and 1896. On July 4, 1897, the community’s focus pivoted. 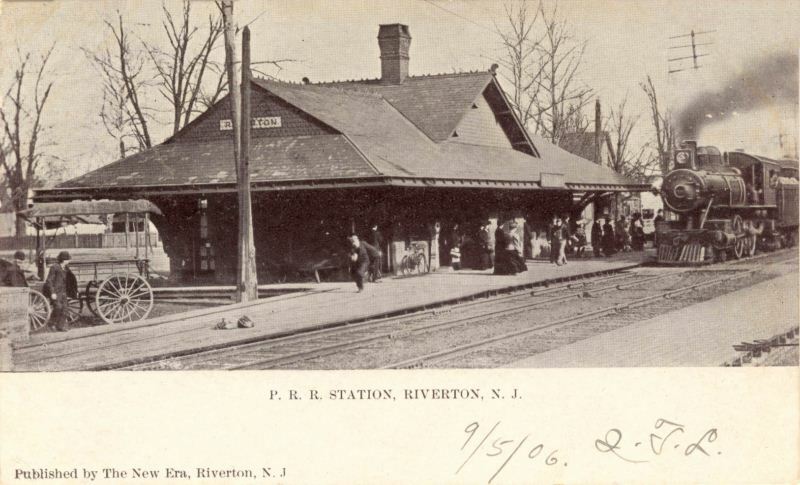 Sure, sporting events remained an important part of the ongoing annual celebration, but by 8:45 a.m. on this 1897 Sunday, a crowd was gathering at the Riverton station, filled with anticipation. Officials had invited the Burlington Band to travel down to Riverton and aid the residents in commemorating the day and all it meant to Americans filled with ardor for their country. The band boarded train no. 315 at the Burlington station and departed at 8:47 a.m. for the eighteen-minute trip to Riverton. Disembarking from the train, the band assembled into formation on Broad Street behind the station and then marched to the Riverton Fire Company headquarters on Howard Street as the drummers beat the cadence. The squad of volunteer firemen stood ready to hoist a new American flag up the pole while the band members solemnly played The Star Spangled Banner. The crowd raised their voices in reverent singing to accompany the band music. The unfurling new flag featured an extra white star in the blue canton, symbolizing Utah achieving statehood and joining the 44 other states then comprising the Union. When Riverton’s first processional formed up, local newspaper editor C.F. Sleeper noted, “The band then led the parade of about 150 sweet little tots all dressed in white carrying silk flags to the river bank in front of Wm. P. Ellison’s where patriotic songs were sung ….” Those silk flags the children carried also featured 45 stars on the blue field. From the onset, the yearly event was known as “The Children’s Flag Parade.” Ellison resided in the original dwelling occupying the address of 405 Bank Avenue. 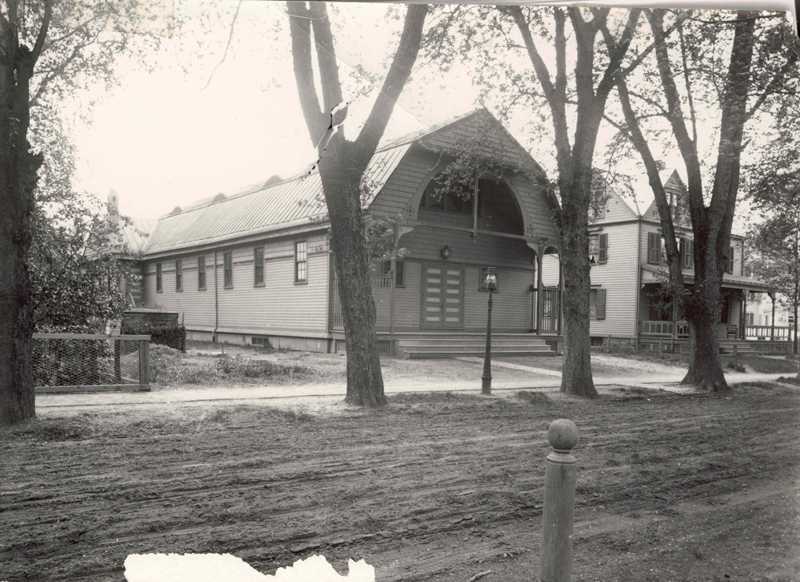 Demolished in the 1950s, Samuel Sloan designed this “cottage” for founder Daniel L. Miller Jr.
A celebratory crowd lined the riverbank, keen on watching the yacht club sponsored boat races, since other sporting events would not be offered. No baseball games would be played, since the 1897 holiday fell on a Sunday, and the velodrome had permanently closed when the 1896 season ended. Three catboats initiated the riverine racing heats, with the FROLIC winning the prize over the larger SEA GULL. Nine mosquito boats took their turn, but several of the craft failed to finish the race. James Coale took the cup, with Norman Ellison and C.C. Rianhard mere inches behind. Only three contestants entered the tub race, in which Tom Kerigan won and William Bishop placed. No exploding fireworks lit up the darkened sky out of respect for Sunday. Instead, the Rev. 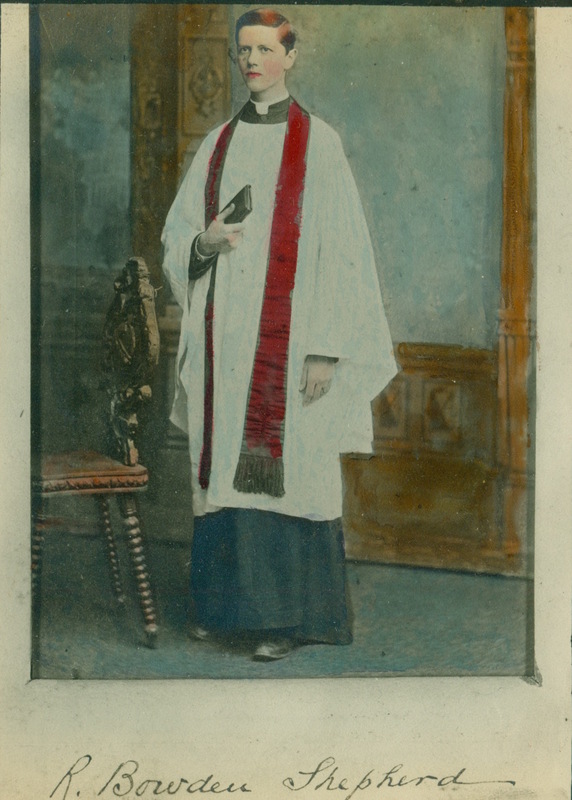 R. Bowden Shepherd, rector of Christ P.E. Church, conducted a patriotic evening worship service on Ellison’s lawn and Judge Hanna delivered an address that touched the American soul. Not present were the town’s young people, who spent the evening at the Riverton Lyceum listening to live music. As the day drew to a close, adults and children alike strolled home to bed under the dim glow of the town’s gaslights. While the preceding account of the Riverton 4th that included the inaugural children’s flag parade may seem a tad tame to those who line Main Street in 2018 awaiting the festivities, the common thread of patriotism and the celebration of a uniquely American holiday remains an intact stitch running through Riverton’s social fabric for the past 121 years. All postcard views from the Paul W. Schopp Collection except the Children’s Flag Parade and the crowd on the riverbank, which are from Nick Mortgu’s collection. Additional links to images in Historical Society of Riverton archives. Who invited this guy Arthur to Riverton’s Fourth? Everyone else is welcome to come, but send him on his way. Arthur, of course, is the tropical storm that threatens to be a party spoiler, depending on the track it takes as it travels up the East coast Thursday into Friday. There is no “rain date” for the parade, but the very thought that Riverton’s patriotic festivities might be in jeopardy gets people wondering. When has the day ever been washed out? I don’t know. One hundred years ago no one was worried about a tropical storm. All thoughts were on the great Independence Day Celebration that lie ahead as described in the July 4, 1914 Philadelphia Inquirer . 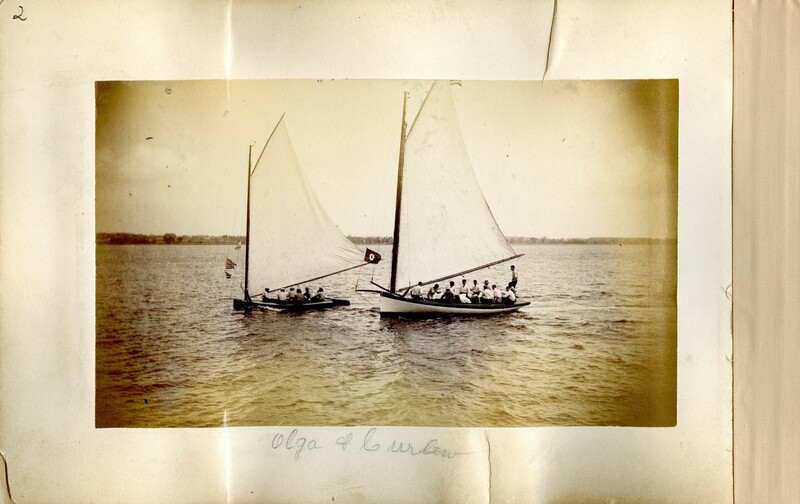 A 1914 July Fourth Program just donated to the HSR gives more details of the big day including sailing instructions, prizes, and a history of the Yacht Club. For a closer look at the rare hundred-year-old document, click on this link for a higher resolution PDF file. Even I have heard of Facebook, but the appeal of Pinterest has eluded me. Then I read that it has an estimated 70 million users. So I signed us up with the help of my friend Mike Solin who hooked us up with new buttons on our webpage for Facebook, Pinterest, Email, and Print. Speaking of pictures, here are some Riverton homes decorated for the Fourth. We will post some more pix of the great day and invite readers to send us some July 4th photos, new or old. In fact, the older the better. As families and friends again congregated on Independence Day in Riverton, inevitably many paused to reflect on other Fourths of days gone by. No doubt this year’s Parade Marshal Mrs. Elsie Waters has stored up many memories since that photo was taken of her and brother John sitting in wonderment at the 1920 July Fourth celebration. FUN FACT: As July 4 fell on Sunday in 1920, Riverton’s Glorious Fourth was held on Monday the fifth. Previous posts have addressed the origin and changes in Riverton’s Glorious Fourth over the past 116 years since the parade began in 1897, much of it gleaned from the research of Mrs. Betty B. Hahle, Town Historian, now passed. More than 100 of her signature “Yesterday” columns written for the Historical Society of Riverton’s newsletter, the Gaslight News still serve as the most authoritative record of our town’s early days. This previously posted four-page 1920 Program (above, right) details the activities enjoyed that day. HSR member Gerald Blaney generously allowed us to scan his rare eBay find and display it here. The July 1920 New Era issues, just digitalized through a joint Riverton Free Library and HSR project late in 2012, provide new insights into Independence Day festivities for that year. The clipping at left from the July 2, 1920 New Era newspaper advises readers of two added features to the program that included a presentation of gold rings to veterans of World War I. Later, the New Era recapped the results of the many games and summarized the patriotic observances witnessed by “fully five-thousand men, women, and children.” The Children’s Parade had 792 kids vying for prizes such as best decorated baby coach, velocipede, or kiddie car. Children gathered on the riverbank and scrambled as a Curtiss F. Boat hydroplane brought over for the occasion showered them with hundreds of tickets good for merchandise at either one of three local stores. You can see the issue as a PDF file just as it appeared to Rivertonians 93 years ago. (You will need the free Adobe Reader program if you do not have Adobe Acrobat.) Scroll down to see PDF page 3 For the July 2 issue and PDF page 7 for the July 9, 1920 issue. Were they the good ol’ days? Absolutely. However, we do not dwell on the past, but simply acknowledge it as we value the contributions of those countless citizens who have helped Riverton develop into the unique place it is today. The following photos and video demonstrate that for many, the experiences of this July 4, 2013 may just as well be recalled in the not too distant future as “the good ol’ days.” Absolutely! Photographer Richard W. Pringle, Jr. kindly sent these photos that include a few great close-ups. Here is a 4min:11sec, 239MB Windows Media Video File showing some highlights of the parade. Wade McDaniels, the Snow Cone Man, brings cool treats and cheer to the Riverton Parade. You never know who you will meet on the Fourth. Here is my former Riverton School colleague and snow cone entrepreneur, Wade McDaniels. After selling the frosty confections here for over twenty years, I guess that feat qualifies Mr. McDaniels to be included in the record of Riverton history. The image gallery below illustrates what we remember in any typical Riverton Fourth of July observance: family, friends, flags, festivities, fire engines, fun, and food. What does a Classic Riverton Fourth of July mean to you? The Fourth is often a time for reconnecting with others who have put some miles and years between themselves and their old hometown. Palmyra native and PHS alum Gary Weart stopped by to see Phyllis Rodgers and family while vacationing from his home in South Carolina. Here he is talking to Phyllis as she tallies the 320 children participating in this year’s parade. Gary Weart, standing, pauses from taking photos to talk to Phyllis Rodgers, HSR President. It turns out the former teacher, whose great-grandfather James Taylor Weart served as Palmyra’s first mayor from 1923-1928, is a keen photo enthusiast who captures images with a truly memorable perspective. Enjoy this slideshow by Mr. Gary Weart, book author, former social studies teacher, administrator, and athletic coach who founded Students Against Violence Everywhere (SAVE), and received the Presidential Service Award from President Bill Clinton. A banner near the Riverton War Memorial announces the Cocktail Party and Concert in the Park during the weekend preceding the Fourth and invites readers to visit http://www.riverton4thofjuly.com/ for a complete list of July 4th events. Here is the Committee’s Dear-Neighbor-Ltr-2013. The other day my friend Phyllis Rodgers compared getting ready for the Fourth in Riverton to getting ready for Christmas. Depending on one’s involvement, other comparisons may come to mind – like preparing for D-Day. Certainly for Tracy Foedisch and the other dedicated members of the 4th of July Committee, they have been preparing for this year’s event even as the sun set on the last year’s celebration. All over town residents display the patriotic hues of red, white, and blue as generations have done here for more than a century. Members of the Historic Society of Riverton will especially cheer on their compatriot, Parade Marshal Mrs. Elsie Showell Waters, as a chauffeured convertible conveys her along the Main Street parade route on July Fourth. Paul Daly, our esteemed HSR treasurer, shares this photo of himself and his wife Cathy bicycling up Main Street during a Riverton Fourth of the late 1970s – perhaps it was for the Nation’s Bicentennial. Patriotic displays have sprouted up all over town – Jim McQuaide, manager of Tristate HVAC, has decked out the landmark building for its first Independence Day under new ownership. Now if the predicted thunderstorms will just hold off, the shoreline (shown above on July 2) should be awash in a flood of spectators viewing the Sixth Annual Great Riverton Raft Race at about 5:30 p.m. tomorrow. You can see the entire schedule of events in the 2012 July 4th Program found here. Click here for the official website of the July 4th Committee. The cover illustration from this year’s July Fourth Program shows an image of the famous “Riverton Nine” baseball team of 1872 taken from the baseball memorabilia collection of Bob Beishline of Palmyra. In 2002, Bob, Mike Robinson, Betty Hahle and a few others were among the first to help me start what has eventually grown into a huge virtual online collection of vintage images by kindly letting me scan their postcard collections. 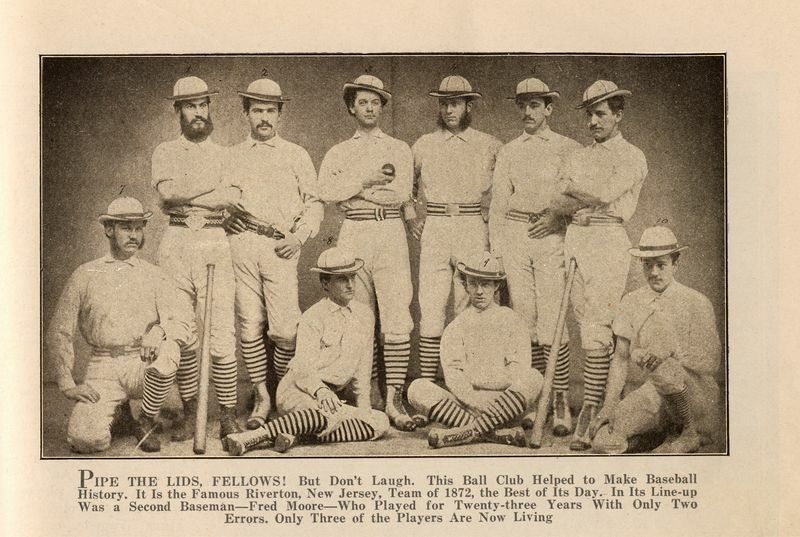 Later, Bill Hall provided me with a Sporting Life magazine clipping showing the same team. When I showed the photos during a presentation at a Society meeting, it was William Harris who explained the caption in the photo. FREDERICK K. MOORE CENTER simply meant that Moore was in the center. All of this concern about baseball is because Mr. Fran Cole, HSR member and lifetime resident of Riverton, who is Parade Marshall this year, used to be quite a baseball athlete and remains among the most fanatic of Phillies fans. He was even inducted into the Palmyra High School Sports Hall of Fame. So by an extraordinary amount of luck and best laid plans we here at the Society just happened to be able to help out July Fourth Committee Chairperson, Mrs. Tracy Hansen Foedisch, when she asked for a hand with supplying some images for this year’s program booklet. It’s nice when we can help reveal some part of Riverton’s past with what we have collected. In a past post I compared the task to completing a jigsaw puzzle. It is an extraordinary privilege, and no small responsibility, to be able to curate the archives of the Historical Society of Riverton for the use of Rivertonians. As family and friends congregate during this July Fourth celebration, may I interrupt for a commercial message? Please help preserve Riverton history by donating your Riverton related photos, collectibles, documents, and memorabilia, or at least send us a scan or photo. If you can help us in this endeavor, please contact us. During the parade HSR members Paul Daly, Gerald Weaber, and myself will be distributing this year’s edition of the Historical Society’s July 4th Palm Cards. The earliest one I have of these is from 1987. Former HSR President Dan Campbell may have started the tradition which seems to have continued through 2004 when it apparently stopped. We resumed the tradition again last year when HSR Treasurer Paul Daly wondered out loud, ” How come we don’t give out those cards on July Fourth anymore?” (See more July 4th Palm Cards here.) If you have any cards for years not shown in this list, please send us a scan of both sides. July 4th Palm Cards: 1987-1990, 1993-1995, 1997, 1999, 2000-2004. If you have some time to kill, type “July 4” or “July Fourth” in the search box at the top right of the home page. That should result in many hits for earlier posts and images related to the holiday. Note to Self: Phyllis Rogers’ observation about the count of children who were actually in the parade gives me the idea to get a closer look at the mayor’s staff that has the bands which record that headcount through the years. Mrs. Tracey Foedisch, Riverton 4th of July Committee Chairperson, told me by phone that I can go to Borough Hall sometime and ask Municipal Clerk Mrs. Mary Longbottom to see it. Meanwhile, here’s another great image, courtesy of Ed Gilmore. Undated, but probably from the same time as his photos in the last post, it affords us a glimpse of a Riverton Fourth “back in the day.” Way back. Ed does not know the identity of the children or anyone else in the photo—any guesses? Elsie Waters again gives us a peek at her family album with this sweet image of big sister Elsie and brother John sitting in wide-eyed wonderment at the 1920 July Fourth celebration. We may infer by the patriotic embellishments to their perambulators that they were participants in the scheduled 9:45 a.m. Children’s Flag, Baby Coach, Velocipede and Kiddie Kar Parade. View the full 4-page 1920 July 4th program in the previous post, Odd Bits of Past July Fourths. FUN FACT: As July 4 fell on Sunday in 1920, Riverton’s Glorious Fourth was held on Monday the fifth. At right is one last look back at another of Ed Gilmore’s captivating photos from that undated parade. Am I that only one that looks at these at great magnification and imagines that I could march down to the river with them? On July 4th, 2011 I caught these video clips with my iPhone and spliced them together to make three short videos, 2-3 minutes each. Each one is a separate download. Check out the Facebook wall for the Riverton 4th of July Committee and see what people have had to say there. Also, you’ll find links to other related topics including newspaper articles and the latest photo galleries. The 2009 and 2010 photo galleries are still posted on the 4th of July Committee’s website. The perambulators may have changed, but the delight to see a child in this parade remains the same. For some real Riverton July Fourth eye-candy, enjoy the photography skills of Mark Brown, a musician and Riverton resident who responded to my request for photos to post here when I distributed the 2011 July 4th Palm Cards. Proposed New Fire House of Relief Engine Co.
P.S. 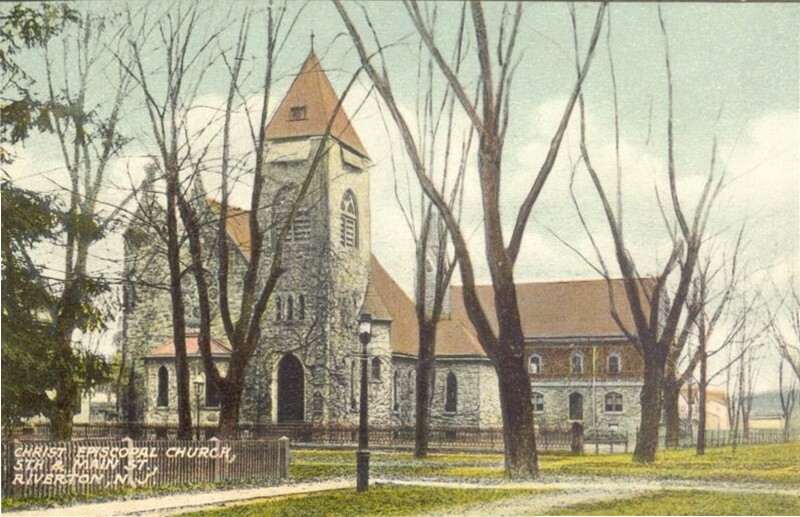 After posting over 300 vintage image of Moorestown here, it is rare to find a new one, but my collector friend just scored another one and sent it for us to enjoy. P.P.S. Save the Date: The Historical Society of Riverton takes our show on the road to Columbus next week, July 20-23, 2011, as we join every local historical society in the County for a “History Faire at the County Fair.” More info to follow in another post. By July 2, 2011, many homeowners were busy giving the finishing touches to the exterior of their homes and even doing some last-minute landscaping in preparation for the throngs of spectators who would be making their yearly pilgrimage from near and far to Riverton’s Main Street for its celebrated annual July Fourth parade. It seems that everyone has their own July Fourth family rituals and cherished memories of the “good ol’ days” whether they be 8 years ago or 80. Philadelphia Inquirer Staff Writer, Jan Hefler, profiled the swirl of activity surrounding one porch party and wrote a story which could probably be repeated in kind, if not in degree, on quite a few other porches. Here is the link for Jan Hefler’s story. Jeannie O’Sullivan, writing for the Burlington County Times, whom I have cited here before, reminds us that memories and rituals regarding Riverton’s July Fourth celebrations are no less vivid for out-of-towners (like myself) whose vantage point for watching the parade has varied from curbside to other people’s porches. Here is the link for Jeannie O’Sullivan’s story. My first memories of Riverton are the times when my grandparents brought my brother, mother, and me to witness the parade and the fireworks that followed at the riverbank. That fifty year old memory is dwarfed by the recollections of many others who can mark so many personal milestones by the number of parades that they have seen pass by their view. Reviving an HSR tradition which apparently had not been done since 2004, Gerald Weaber and I handed out several hundred July Fourth Palm Cards during the parade and during the raft races. I confess that I largely plagiarized bits from previous series of palm cards and hastily printed them up the night before. Readers, in your spare time, please check your old July 4th palm cards against these dates: 1987, 1988, 1989, 1990, 1995, 1997, 1999, 2000, 2003, 2004, and send me a scan of any more dates that you have. I would very much like to document what has already been done other years. Maribeth Paige Shaffer was one of the people to whom I distributed the new cards. She kindly responded to my request to send photos of the raft race to post. Thank you, Ms. Shaffer for the brilliant photographs .